Frank Cassidy: Nil Gar Ann! 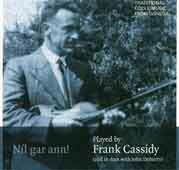 Cairdeas na bhFidileiri continues its important work to make available the music of past great figures of Donegal fiddle playing, this time with a collection which features Frank Cassidy (1900-1971), and which offers the listener ample proof that Cassidy's tremendous reputation as a player is entirely justified. Like his cousin Con Cassidy, who was the subject of the previous release in this series, Frank Cassidy was from Teileann in south west Donegal, and grew up in a musical family--his older brother Johnny is said to have been an even better player, but no recordings survive. Johnny and Frank were the makers of the famous brass fiddle which adorns the cover of the CD by the same title. The 35 tracks on this CD include several spoken testimonies, by the like of Con Cassidy and Seamus Ennis, about Frank Cassidy and his playing. The music tracks, which span the years 1946-1967, and include several fascinating duets with John Doherty, another great of Donegal fiddle music, are often stunning, especially the many slow airs which Cassidy evidently loved to play, and which he did play in most extraordinary fashion. Repeated performances of the same tunes also provide unusual insight into the evolution of Cassidy's style over the years. The record notes, by Rab Cherry and Dermot McLoughlin, paint a fascinating portrait of a lonely and mysterious man and his art. Like the recent Con Cassidy CD, this is essential listening for fans and students of Donegal music, indeed for anyone interested in the Irish music tradition.